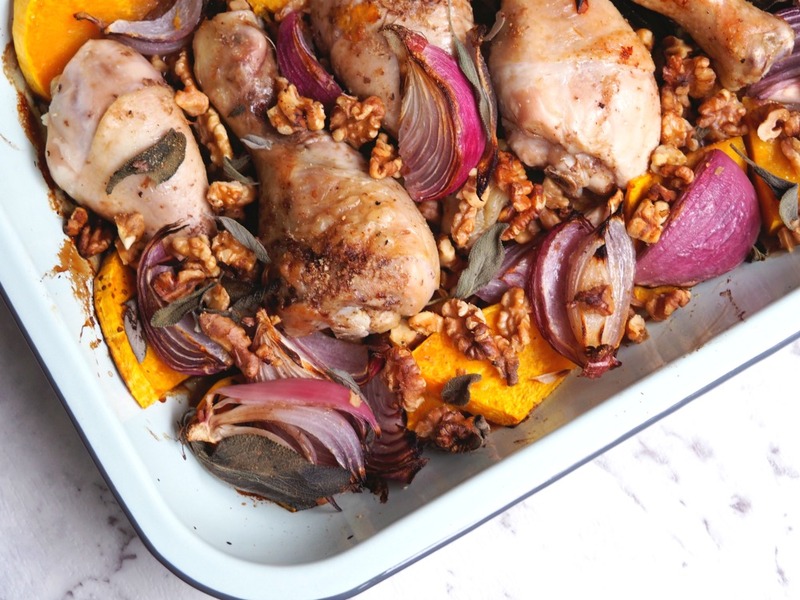 With golden baked chicken and sticky roasted veggies, this one tray wonder is a winner, winner chicken dinner. 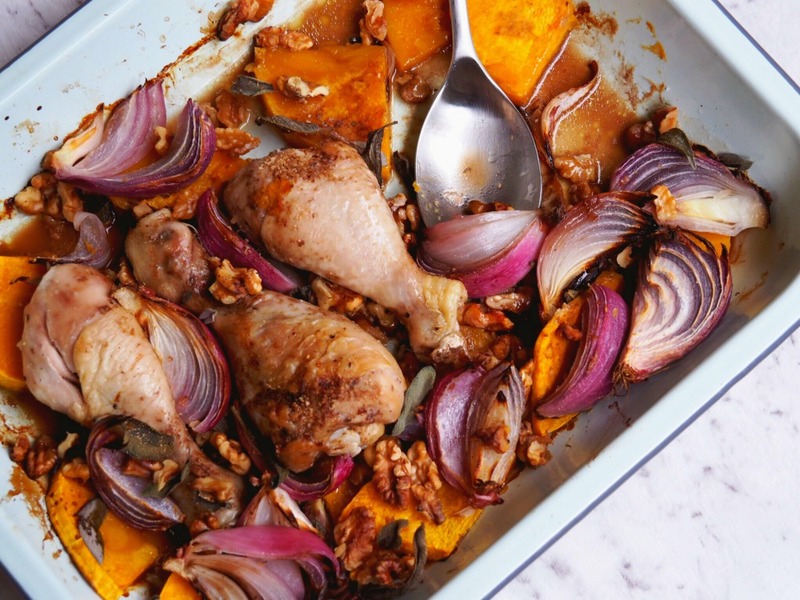 There’s a lot to love about this dish – it’s simple to throw together and it’s as delicious as it is colourful. 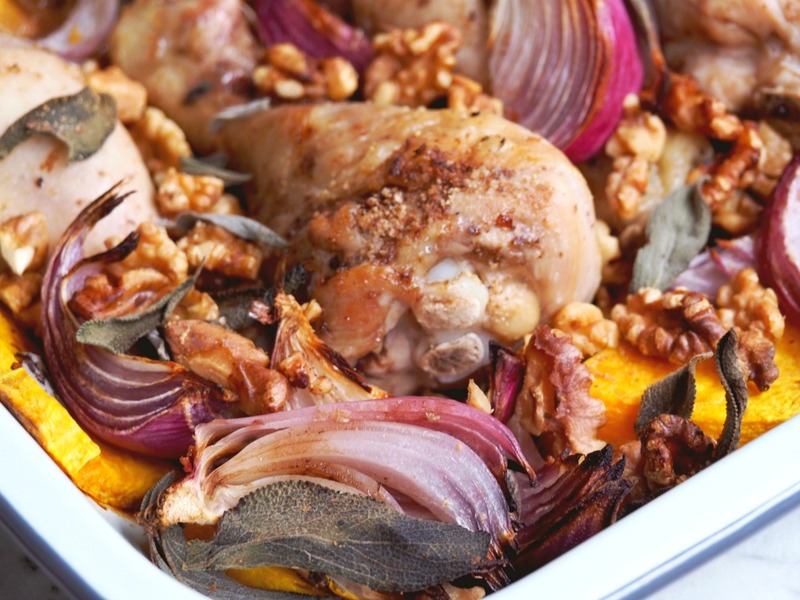 There’s as many textures as there are colours with the juicy roasted chicken, the soft, sticky veggies and the crunchy walnuts. And if all that’s not enticing enough, it’s low iodine too! That pesky low iodine diet never looked so delicious! So the other day I was listening to The Minimalists podcast on the topic of Health. I will have to listen to it again because there were so many take aways only my memory is so bad I can’t remember them! I do remember however, that there was a discussion about eating meat and how in the very olden days, they ate all the animal not just the bits they fancied. I’m not quite at the offal stage yet, but I thought I should at least broaden my chicken repetoire from breasts to legs, and this one tray wonder seemed like a good place to start. Another thing I picked up from the podcast, contrary to what I’ve always believed, chicken skin is not bad for you! It actually contains lots of good fats, albeit with a few extra calories, so I see more chicken skin in my future! And to think of all these years I’ve been picking it off! Do you have a favourite part of the chicken? Have you got a podcast recommendation to share? Heat oven to 220C/200C fan-forced. 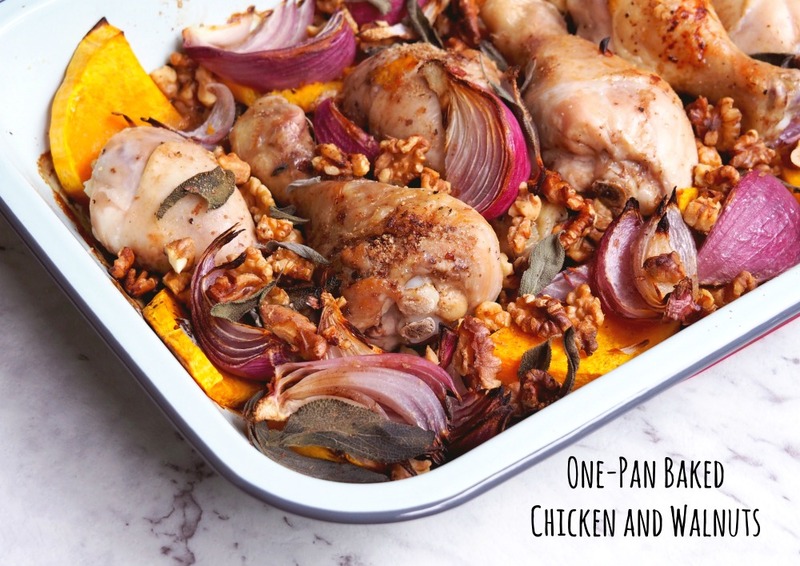 Place chicken pieces, pumpkin, onion and oil in a large baking pan. Toss to coat and season well. Arrange chicken skin-side up and bake for 25 minutes, or until chicken is starting to brown. Add sage, walnuts and drizzle over the vinegar. Toss to combine. Bake for another 25-30 minutes, until chicken is golden and cooked through. 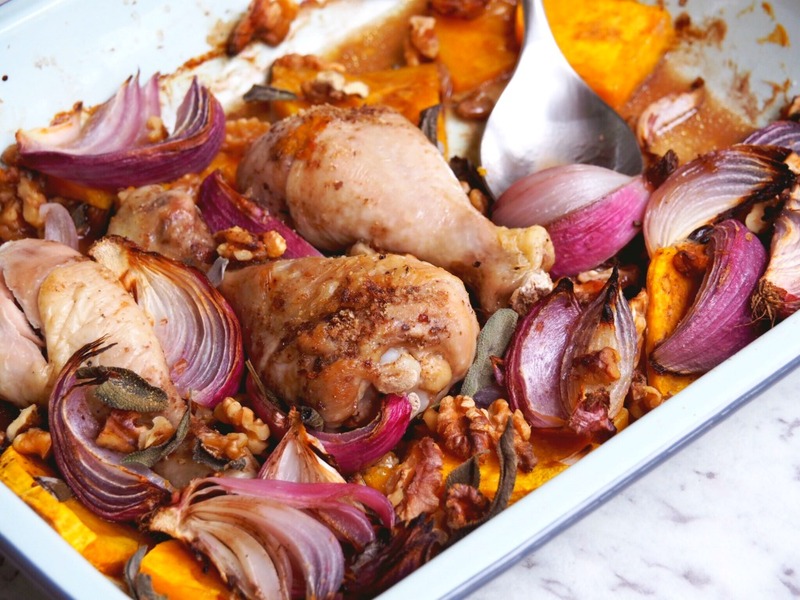 Serve straight from the tin with some healthy sweet potato and carrot mash.